Detectives Beyond Borders: Enough about climate change; what about language change? Of course this is of interest to me. As I just had a frustrating experience of looking into a word where the origins of a word have become blurry, I'm sure that future word researchers will be happy to be able to dig out this post to understand what that tag is doing there. I can see one situation where "paying the price tag" would be appropriate: when there is no opportunity for negotiation. The price tags reads, $20. Customer says, "I'll give you $18." Shopkeeper replies, "No negotiations. You'll pay the price tag." This reminds me of a phrase musicians sometimes use. To "play the ink" means to play exactly what is written; no improvisation or embellishment. And the invitation, of course, goes out to all of your many followers. I do not know if the blog will be successful or popular, but (what the hell!) I at least like the title. 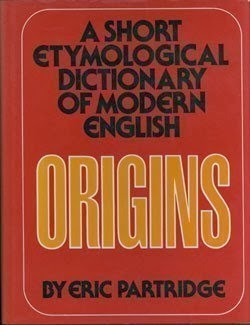 Seana, you'll no doubt know of Eric Partridge, If you haven't flipped through his books, you ought to do so forthwith. I thought of you when I put up this post, though crime is unlikely to turn up at your place; its meaning is so transparent--or so we think. But then, Origins is about common words, the 10,000 most common words in English, with subentries bring the number to 12,000. Even words we don't think of as odd, mysterious, or puzzling have compelling histories of their own. RT, here's the link to your new blog: http://ahsweetmysteriesoflife.blogspot.com/. Qiu is a good choice. I cited his first novel in this blog's first post, and it remains to this day one of the most memorable crime novels I have read. I can, and likely will rant, expostulate, and hold forth on redundancy, circumlocution, and periphrasis in English speech, writing, communication, and, naturally, discourse. But first a bit more on why I find Partridge's history of crime so interesting. I don't know over how long a period the changes in usage he chronicles took place. but imagine you're the same person you are now, with the same attitudes toward language and usage. You're accustomed to crime in that older sense of decision or accusation. Then you start to hear or read town criers and marketplace gossips using crime to mean misdeed. You'd rant and tear your hair out and moan about last usage. And so would I. But that barbarous innovation is by now so thoroughly domesticated that we even speak comfortably of "crime" fiction. I do not, of course, advocate a permissive stance, in which very ugly buzzword and slang coinage be accepted in formal speech and writing. But one must recognize the constant tension between tradition and innovation, an exciting phenomenon and a stimulus to study of our language, I'd say. Dana, your example would be metonymy, or metaphor, in which one thing ("price tag") is used to express something else associated with it ("price"). The shopkeeper really means "No, you'll pay the price marked on the tag," or, in short form, "The tag price." On the subject of crimes then-and-now in history, I have read extensively about Tudor history. I am always surprised about that culture's view of crimes versus our view of crimes. In many ways, we have become more civilized. In some ways, though, especially given our use of capital punishment, we remain equally barbaric and insensible. Perhaps my views on crimes and criminals (compounded by my previous career in military justice - U. S. Navy) and my interests in early modern history are the underlying reasons for my interest in reading crime/mystery/detective fiction. The most frequent then-vs.-now comparison I have encountered marvels at the number of infractions punishable by death then. Here in America, too, shame was much more an object of punishment than it is now. See The Scarlet Letter or the stocks and pillories at colonial Williamsburg. One also finds vestiges of the past in the names by which we call our penal institutions: houses of correction or penitentiaries. These days, truth in labeling would demand they be called houses of punishment, since that is what we as a culture seem to be interested in. Seana, which word was the source of your frustrating experience? Lent? No, Lent was the word I came upon while looking into the frustrating word. I may dig deeper later, as Lent seemed more appropriate to the day. As to prisons, I'm not sure whether they should be called Houses of our general indifference, or houses of our mass entertainment. It depends on how many people actually watch Lockup. Lockup is nice and morally neutral, I'd say.